Whenever I speak to somebody who has deep rooted aspirations of becoming a writer, it’s never long before they ask me this question and I’m going to be quite a little controversial here. This isn’t me trying to be clever or insinuating that I have a stronger creative mind than those who claim to suffer from the dreaded “block of writing.” Far from it! 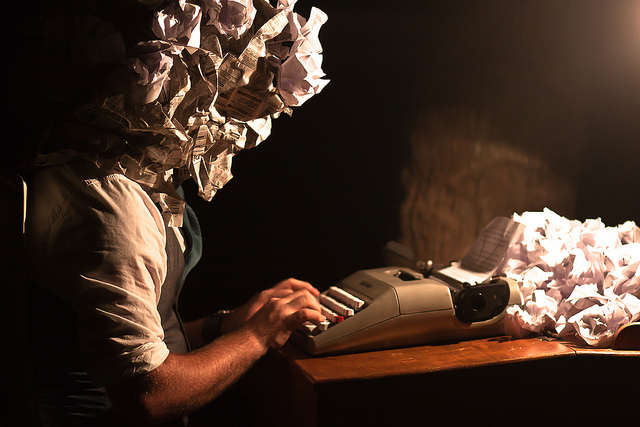 I simply feel that “writer’s block,” as a practicality is a myth, an illusion and, dare I say it, an excuse. Don’t get me wrong – we all have days where we can’t write. Even if we force ourselves to spawn a concoction of words, we look upon them like we would a guilt-edged one night stand – with inward disgust and shame. So instead of writing about how to “beat” writers block, I thought I’d take the liberty of offering more practical solutions as to why you aren’t able to produce the pages you believe you should be? It happens more often than you might think. Maybe you awoken from a strange dream that you thought might make an incredible story, but in the cold light of day, the idea’s actually a little stale. Sometimes we get so frustrated with life that we can go off on a tangent with even the loosest of ideas, believing more in hope than judgement that this might be the project that achieves your dreams. However, while I will never discourage you from writing all ideas down, creating good, fully formed stories is hard work, so if you don’t fully believe in your idea, it’s highly likely you’ll run out of legs way before the end. Make sure you’re passionate about an idea for the right reasons before telling yourself it deserves your time. Although there should be a basic marketing plan in place before you start writing, first drafts are the one time you should be completely free from any pre-conceived ideas of structure. Guillermo Arriaga wrote 21 Grams because he drove past a man who had been killed in a hit-and-run whilst driving to his own birthday party. By simply writing the thoughts that flashed through his head, and allowing himself to be led by the emotions stirring within him, we ended up with one of the most stunningly original films in recent memory. The Silver Linings Playbook adopts a first person narrative and is written in a style of our hero grappling with manic internal struggles. I don’t know this, but I image large chucks of the final text were created through free association writing, and this is sometimes the best way to write because it’s unrestrained. So forget what your story “should” look like for a moment. There’ll be plenty of time for that in later drafts of your work. Instead, be wild. Be original. Be free. Given that heavyweight filmmaker Francis Ford Coppola once stated “I don’t think there’s any artist of any value who doesn’t doubt what they’re doing,” I think we can accept we’re in good company when we lack a bit of confidence in our own work. It’s good to set high standards for yourself. However, sometimes we enter a rather funky state-of-mind that we can’t snap out of and this very simple reality might be the reason our work seems a little off. Find a reader or two who won’t pander to your ego and whose opinions you really trust, then ask them what they think of your work. If they say it’s bad, just put it down to a bad day / week / month at the office and start again. You never know. They might come back with more positive news than you’re anticipating and sometimes that fresh external view is all you need to re-ignite your passion and keep going. When you’re desperate to get a project finished, it can be very hard to accept that you need to step away. Your mind will tell you that you should be able to finish, but the reality is that you might have crammed too much. Maybe a strained relationship is affecting your mind more than you realise. Maybe you just need some sleep or a quick weekend away. If only I had a spare day to sit at my computer, I’d write an absolute masterpiece. The truth is, life – and most certainly art – doesn’t work this way. When you finally get that day off you might find that you spend the day skipping between running errands you’ve never even dreamed of before and staring and a blank word document. It is through life we get inspired, so embrace going to work, watch the people around you on the tube. Stimulation leads to inspiration. 5. You aren’t good enough to pull it off… yet! This is one of the most difficult things to admit because nobody enjoys feeling like a failure, but think about James Cameron for just a moment. You see, love or loathe him – and I really don’t understand people who have anything but love for old Jimmy C – he is a man of strong creative integrity. He didn’t allow himself to work on Avatar until he trusted that both modern technology, and his skills as a director, would allow him to pull it off. He knew that once the budget was raised and principle photography had begun, there would be no going back, so he was patient. He had also done this several years earlier when the studios were desperate for him to write Terminator 2, which is still to this day one of the most hotly anticipated movie sequels of all-time. He knew he simply wasn’t ready and so he delayed the decision, putting it off for the best part of a decade. This is the difference between an amateur and a professional. Professionals know their limits and they also have a better idea of how much graft is involved. There’s no shame in not being ready to take on an idea. Just shelve it and work on something more feasible for where you are as a writer today. If you like the article, why not share it with your friends on your social media channels? Likewise, if there are any questions or points that you’d like to add, let me know on the comments box below. *Article image courtesy of Drew Coffman vie the following license on Flickr.